Use interactive sliders to let learners manipulate data, explore cause-and-effect relationships, and control other objects in the course. Go to the Insert tab on the ribbon, click Slider, choose a slider type, and click the slide where you want the slider to appear. Tip: By default, sliders are horizontal, but you can make them vertical if you'd like. Just rotate them 90 degrees. You can use the rotation handle at the top of the slider or the Rotate drop-down on the ribbon. Sliders have a track and a thumb that slides along the track. 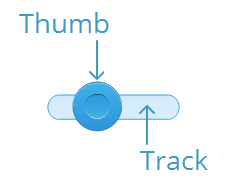 The track and thumb can be resized together or individually. To resize the whole slider (track and thumb), drag a corner sizing handle. To change the length of the track, drag the left or right sizing handle. To change the thickness of the track, drag the left yellow handle up or down. To resize the slider thumb, drag the top yellow handle up or down. To control the behavior of a slider, select the slider, go to the Slider Tools—Design tab on the ribbon, and adjust the following properties. This is the variable associated with your slider. Storyline automatically creates a number variable for each slider in your course. If you want to change the variable that's controlled by a slider, use this drop-down to select another number variable in your course. Learn more about variables here. This controls when the variable gets updated. You can update the variable as the learner is dragging the slider (which is the default setting) or only after the learner releases it. Storyline gives each slider a default name: Slider 1, Slider 2, etc. We recommend giving them more intuitive names, so they're recognizable when adding triggers and creating freeform interactions. One way to rename a slider is to right-click it, select Rename, enter a new name, and click OK.
Another way is to double-click the slider in the timeline to open it for editing, enter a new name, and press Enter on your keyboard. To change the styles, colors, and effects for a slider, select the slider, go to the Slider Tools—Format tab on the ribbon, and use the formatting options. Generally, you'll want to perform one or more actions based on a learner's interaction with the slider. To do that, you'll need to add triggers that execute when the slider moves or the variable changes. For example, you might change the state of an object when the learner drags the slider. To learn more about triggers, see this user guide. There may be times when you want to display the value of a slider in a text box or shape. It’s easy to do. Just add a variable reference to any text element in your course. 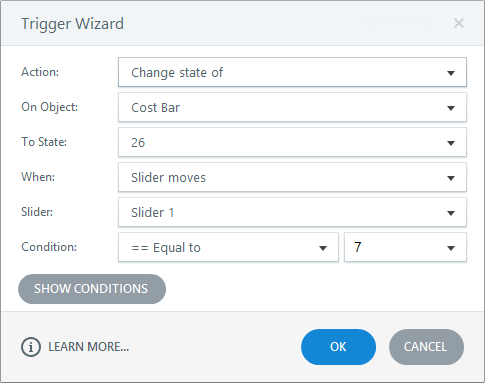 When the learner drags the slider, the value that's displayed in the text element automatically updates to show the value they selected. To delete a slider, select it on the slide or in the timeline, then click Delete on your keyboard.